All energy is vibration -- including sound, especially the sound made by wind chimes. 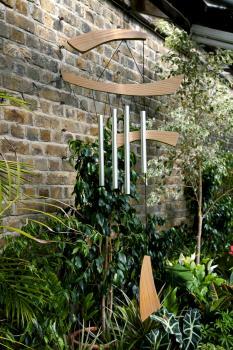 Guiding the sound vibration in a space with wind chimes can be a remedy or a good luck magnet in feng shui. There are a few classic principles to help you enhance the power of wind chimes to bring positive chi into your life. In feng shui, wind chimes activate stagnant areas where chi is stuck by diffusing old collected energy and bringing in new healthy energy. Each wind chime has its personality and performs differently to affect the surrounding chi. Bamboo or wood rods in the East portion of the space strengthen health and family. In the Southeast, wood chimes attract wealth. Metals of every kind heighten creativity and children's wellbeing in the West. In the Northwest, metal safeguards travel and multiplies the number of helpful people in your life. Copper tubes, capiz shells, fired clay, glass, and bamboo culms create unique sounds, each pleasing in its own way and each an effective energizer. Intuition and common sense are the best way to select the right tone. A deep metal resonance may chime out protection in a large yard -- but it could drive your neighbors crazy on an apartment complex balcony. The soft clink of capiz shells just inside French doors stirs the interior space and slows a rush of energy so it enters a home in a flow, not a flood. The muted clunk of bamboo is quietly protective in a child's bedroom. Listen to the chimes and allow them to speak to you. And give them each their voice. Don't cluster wind chimes all in one space, or they will turn into so much competing noise. Remember there are no hard and fast feng shui rules for using wind chimes, but do take advantage of number wisdom when selecting the number of rods. In general, odd numbers are yang and even numbers are yin. Three and multiples of three (six, nine) contain wealth, accomplishment and attainment energy. Four is a strong foundation and security. Five stands for all five elements and represents dynamic change (in a good way). Seven expands and deepens self-knowledge. Eight is prosperous growth, success, and ongoing abundance. When you love a tuning but aren't sure about the number of rods, test a couple of the same style chimes by striking the rods with the clapper to hear the combination of tones that sounds right. 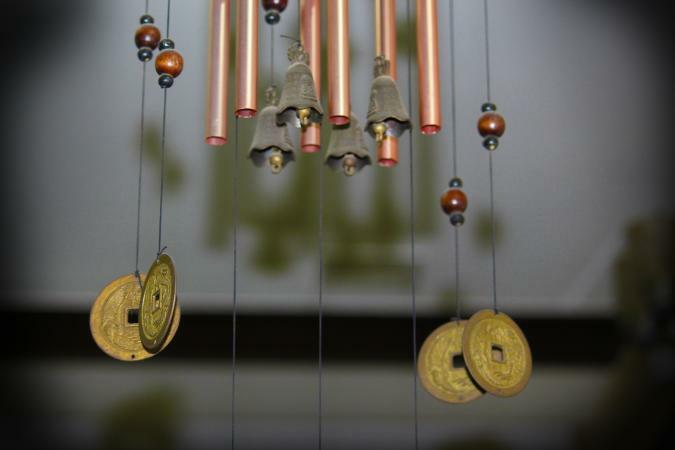 Chimes can enhance an auspicious area of your home or office, ward off harmful energies, such as poison arrows pointed at your house, and create a pleasing oasis of art and sound to enliven a garden, an entrance, or an indoor room or passage. 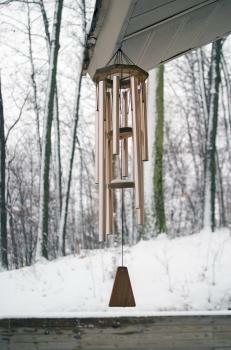 Ideally, the wind should activate the chimes, so you would place them outdoors where they can catch the breeze. But tweaking the clapper as you pass indoor chimes releases the sound and works just as well to activate the chimes' beneficial energy. A wind chime at the entrance of the home can signal the movement of visitors (or intruders) and will circulate more energy in this important "mouth of chi." This beneficial energy disturbance has the same effect as a small water feature, like a fountain. Hang a metal wind chime over the foot of a staircase that faces the front door to prevent positive energy from rushing down the stairs and out the door. Deflect the harmful energy from poison arrows (oncoming traffic, sharp corners) that threaten your home with one or more yang (odd number) wind chimes hung outside the home. A wind chime in the doorway or passage between a kitchen and bathroom, or a front door aligned with the back door, interferes with an energy drain and prevents your good luck from rushing or flushing away. Never hang a wind chime directly overhead in a work area, dining table, seating area, or bed. That energy overhead is unhealthy and could cause mental confusion, illness, or headaches. Use a wind chime to blast apart the sticky energy of a clutter-catcher -- a place where clutter always accumulates. This breaks the hold of the clutter and makes it easier to keep the area clean. Regardless of the design of the cap and sail, whatever the color of the rods and strings, take care how you hang the chimes. Always hang them from the attached or enclosed O ring or hook. If you add chain or string to the O ring in order to hang chimes lower, you upset the balance. That destabilizes the chime and makes it wobbly and jangly. The motion and sound should always come from the movement of the sail or wind catcher that activates the clapper which strikes the rods. If the wind chime doesn't "fit" where you want to hang it, that's not the right wind chime for that location. The colors of the rods, caps, clappers, sails or wind catchers, and connecting strings are less important than where you hang the chimes. Don't expend too much energy on those details. Choose red string for a subtle hit of fire energy or aquamarine sea glass pendants for tinkling serenity. A mystic knot at the top of the wind chime, just under the O ring from which you hang it, is lucky. A slice of amethyst as the wind catcher or sail adds a note of lighter energy and healing to the movement of the chimes. Your personal taste is probably a good enough benchmark of what style to choose. Wind chimes are among the most delightful feng shui cures and enhancements. They tap into the ancient Chinese deification of sound; many thousands of years ago only members of the royal family and visiting dignitaries were permitted the celestial luxury of musical entertainment using chimes and bells. That sacred energy translates to the unspoken power of the chime to capture the wind, harness its potency, and place it in the service of a higher good: your pleasure, prosperity, and good fortune.